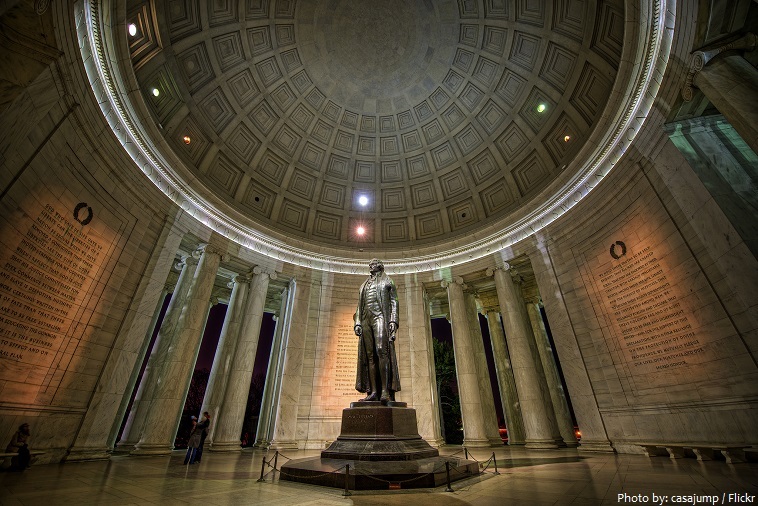 The Jefferson Memorial is a presidential memorial in Washington, D.C., dedicated to Thomas Jefferson (1743–1826). 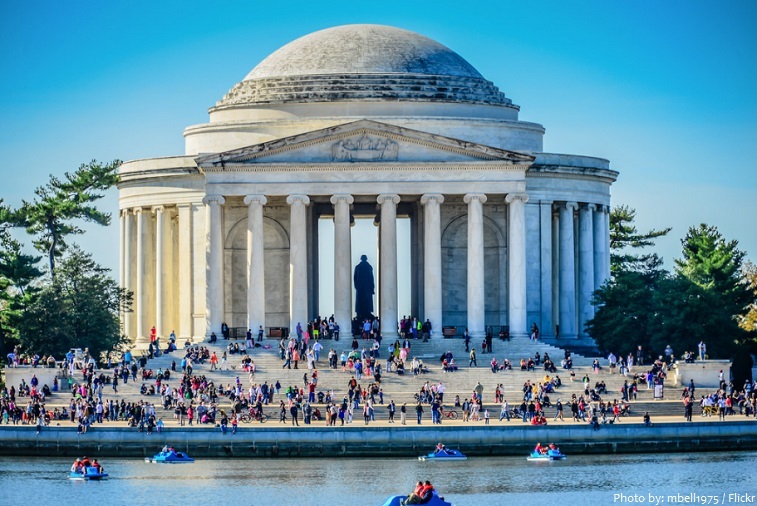 The location and architecture of the Jefferson Memorial make it stand out among DC’s amazing array of monuments and memorials. Surrounded by water, the structure is located on the National Mall‘s Tidal Basin, a large body of water that is bordered by DC’s famous cherry blossom trees which were a gift from the people of Japan in 1912. 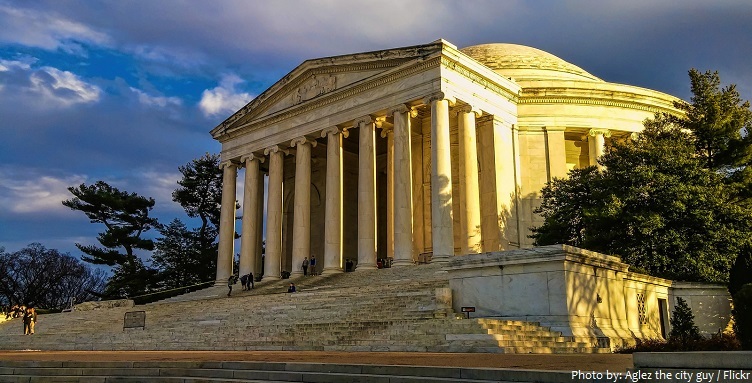 The neoclassical Memorial building was designed by John Russell Pope and drew its inspiration from the Pantheon in Rome as well as the Rotunda at the University of Virginia, which Jefferson himself designed. 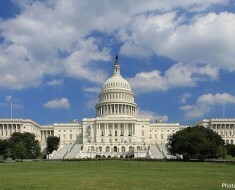 Construction began on December 15, 1938, and the cornerstone was laid on November 15, 1939, by Franklin Roosevelt. By this point John Russell Pope had died (1937) and his surviving partners, Daniel P. Higgins and Otto R. Eggers, took over construction of the memorial. The design was modified at the request of the Commission of Fine Arts to a more conservative design. The Jefferson Memorial was officially dedicated by President Roosevelt on April 13, 1943, the 200th anniversary of Jefferson’s birthday. 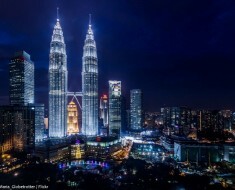 The cost of construction was slightly more than $3 million. 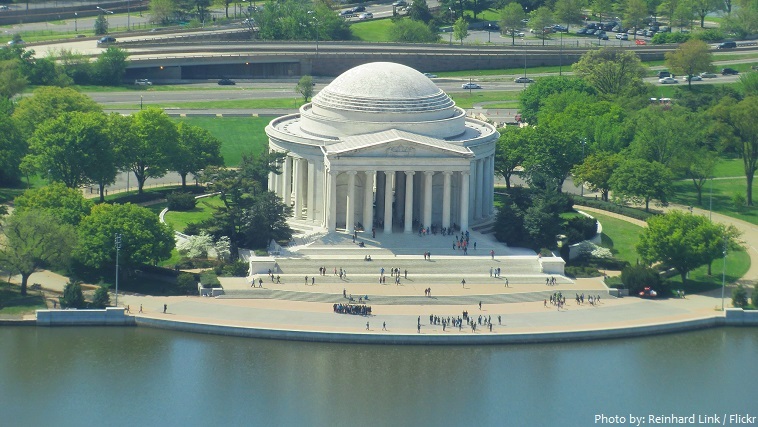 The Jefferson Memorial covers a total land surface area of about 7,410 square meters (79,758 square feet). The memorial is constructed of white Imperial Danby marble from Vermont and it rests upon a series of granite and marble-stepped terraces. A flight of granite and marble stairs and platforms, flanked by granite buttresses, lead up from the Tidal Basin. 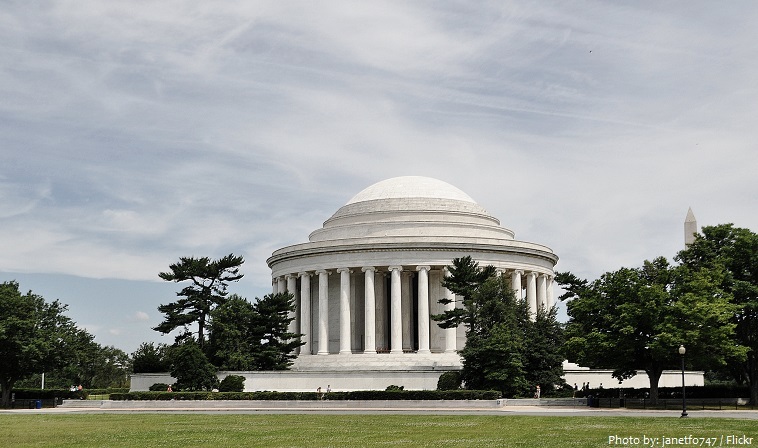 The memorial building is a circular, open-air structure featuring a shallow dome supported by a circular colonnade composed of 26 Ionic columns. An additional 12 columns support the north portico, and 4 columns stand in each of the memorials 4 openings. There are 54 columns in the Jefferson Memorial. 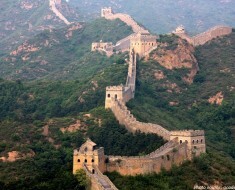 Each column is 13 meters (43 feet) tall and 1.6 meters (5 feet 3 inches) in diameter. 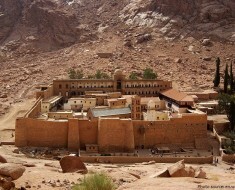 The portico (columned front entry) is 31 meters (102 feet) wide. It has a triangular pediment, which features a sculpture by Adolph Alexander Weinman, depicting the five members of the drafting committee of the Declaration of Independence submitting their report to Congress. The Jefferson Memorial interior is constructed of white Georgia marble with an axed finish, and the floor is made of pink Tennessee marble. The interior freize is topped by a dentiled cornice and a massive Indiana limestone dome. The memorial chamber is 50 meters (165 feet) in diameter. 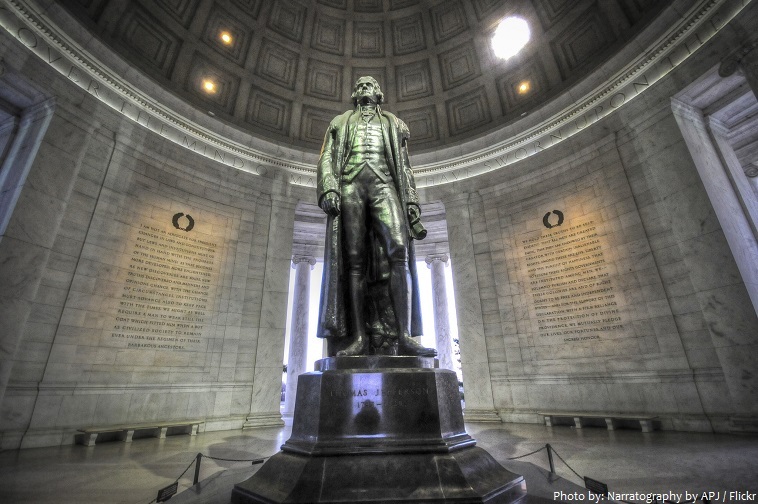 The memorial chamber has a 5.8-meter (19-foot) tall, 4336 kg (10,000 lb) bronze statue of Jefferson by the sculptor Rudulph Evans showing Jefferson looking back at the statue of Alexander Hamilton, a former rival of his. This statue was added four years after the dedication; Since wartime metal rationing was something that could not be overcome, the original 1943 Statue was made of plaster and coated with bronze-colored paint. When wartime rationing and restrictions were loosened in 1947, the bronze became available for the permanent Statue. Most prominent are the words which are inscribed in a frieze below the dome: “I have sworn upon the altar of God eternal hostility against every form of tyranny over the mind of man.” This sentence is taken from a letter written by Jefferson on September 23, 1800, to Dr. Benjamin Rush wherein he defends the constitutional refusal to recognize a state religion. 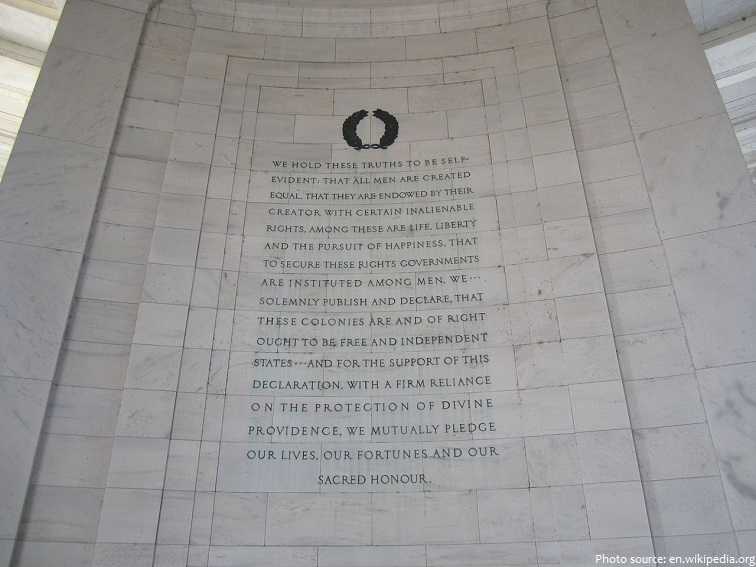 • An excerpt from the Declaration of Independence, the document for which Jefferson is best known, is located on the southwest wall. • The southeast wall features a statement on the evolution of law and the constitution, which was taken from a letter written to Samuel Kercheval in 1816. • The northwest wall is inscribed with a combination of six quotations taken primarily from Jefferson’s “1786 Notes of Virginia” and “Summary Views,” which illustrate his beliefs in the evils of slavery and the need to educate the masses. • The northeast wall contains a quote from the “Act of Religious Freedom,” which was adopted in 1779 and eliminated the state church of Virginia; this quote expresses Jefferson’s views on freedom of religion. The Jefferson Memorial is managed by the National Park Service of the United States Department of the Interior under its National Mall and Memorial Parks division. 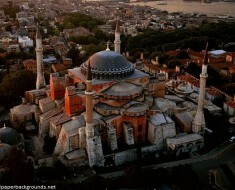 In 2007, it was ranked fourth on the “List of America’s Favorite Architecture” by the American Institute of Architects. The memorial appears at its most picturesque in early spring, when the cherry trees encircling the Tidal Basin are in bloom. Approximately 3 million people visit the memorial annually. 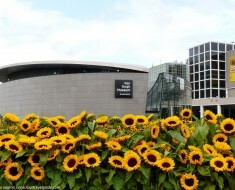 It is open to the public 24 hours a day. The monument is not as prominent in popular culture as other buildings and monuments inWashington, D.C., possibly due to its location due to its location well removed from the National Mall and the Washington Metro. 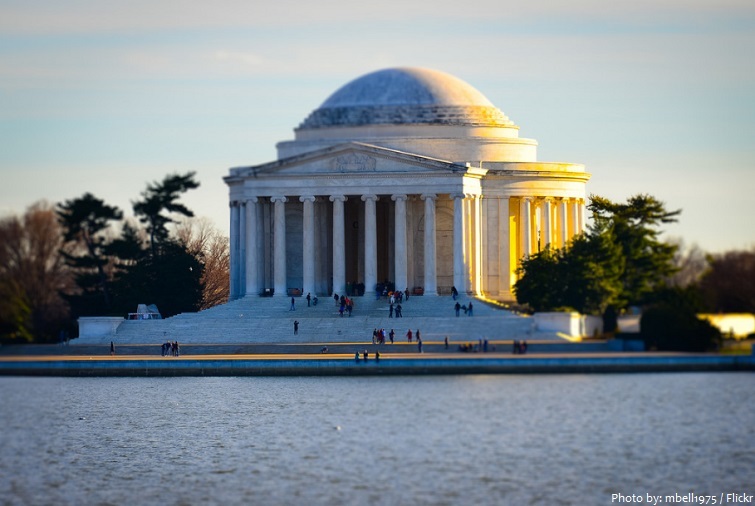 Each year the Jefferson Memorial plays host to various ceremonies, including annual Memorial exercises, Easter Sunrise Services and the ever-popular Cherry Blossom Festival.